Includes 8-Function Remote Keyless Entry, 2 Shaved Door Popper Kits, 2 Relays, 2 Relay Harnesses, 2 Door Lock Cable Adapters, and 2 Door Poppers ---------------------- Keyless Entry Features Feature 8 Channels of Output Feature Starter Kill Feature Trunk Pop Feature Code Rolling Technology Feature Code Learning Technology Feature Constant and Pulse Outputs Feature Parking Light Output Feature Ignition Kill Output Feature Plug in Harness Feature Controller- Material ABS Plastic Height 1.25 Length 2.75 Width 2.75 Feature Receiver- Material ABS Plastic Height 1.25 Length 2.5 Width 2.25 Feature Transmitters- Material ABS Plastic Height. 5 Length 1.75 Width. For almost 40 years, Steves House Of Speed has been satisfying customers' needs by providing them with the parts they need at the lowest prices. We house the most comprehensive collection of parts and accessories in the world. If your parts-shopping experience is a hit-or-miss or simply unsatisfactory, switch over to us. You won't regret it! We offer the Right Part and the Perfect Fit!!! Other auto parts stores carry only a couple of thousand parts in stock. Sometimes, it can get very frustrating when you spend time, sweat, and gas only to be told that they don't have what you need. Well, you'll never experience that here at Steves House Of Speed! Our huge warehouse has over 1 million parts for over 25 million different vehicles. Add to that more than 100,000 accessories for over 6 million rides and what you get is the right part with the perfect fit. No more frustration, no more stalled restoration projects, no more having to wait to get back on the road! You'll find what you want right here. We stock products that are just as good (or better) than those your ride came with. If you need your parts fast, then you'll feel right at home here with Steves House Of Speed. Shaved Handle Door Popper 2 Door Kit 85 lb w/Remote. 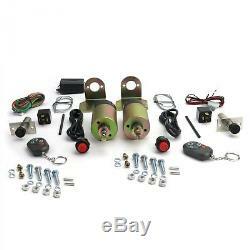 5 Length 1.75 Width 1.5 ---------------------- Solenoid Kit Features Solenoid 108lbs Door Pop Yes All Latches Shave Door Yes All Latches Door Poppers Not Included Button 1 Height. 5 Width 1 Feature Solenoid Features - Height 2 Length 5.25 Width 2 Feature Travel. 75 Harness Included Mounting Bracket Adjustable Cable Included Feature Length 17 Fuse Included Adapter Included Length 3 Wide 2.75 Height 2.5 Harness Included Mounting Bracket Adjustable Cable Included Fuse Included Adapter Included ---------------------- Door Popper Features Feature Adjustable Tension Feature Anti-scratch Tip Feature 100 Welded Seams Feature Fully Chromed Length 2.78 Shaft Dia 5/8 Rubber tip 3/4 Compression stroke 7/8 Mounting flange 2 x 1. Stock photos may not be an exact representation of the item. Please read all product info, descriptions and terms before purchasing. All of your items fit in one box. The item "Shaved Handle Door Popper 2 Door Kit 85 lb withRemote" is in sale since Wednesday, January 3, 2018. This item is in the category "eBay Motors\Parts & Accessories\Car & Truck Parts\Exterior\Other". The seller is "steveshouseospeed" and is located in Patterson, New York.